I'm so happy that I reread this book. Pretty much as soon as I read the last page I was thinking of starting over again. Having reread this book with more of an acquaintance with William Blake's work I feel I actually got more out of the story than I had previously, seeing more connection between Blake and the book's narrative style. Also, I feel that I can understand Dolarhyde more now that I have a better handle on the Marriage of Heaven and Hell. I'm still in denial about Freddy and super in love with Reba, nothing's changed with either of those. 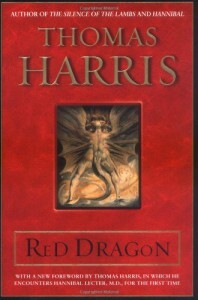 Harris really incorporates the idea of a Christian, religious horror into his conception of the genre as a whole. A book that could have become just an ordinary slasher rose above the format and became a commentary on so much more, on the very nature of family and how it relates to conception of the self. Dolarhyde's familial history along with his particular brand of violence shows the family as an element of destruction and chaos within his life which serves as a direct contrast to Graham's family which pulls him away from violence.